I am reluctant to do this, but it seems to be the tradition to write a brief CV, so here goes. I grew up in the beautiful county of Cornwall in the far South West of England. After going to a small music college (The Eric Gilder School of Music) in London, I got my first professional job touring round Germany. Then came the usual jobs which musicians get, or used to get - playing in pubs (jazz gigs), restaurants, dance-halls, concert-halls, night-clubs and elsewhere. Night-clubs in those days were "refined" places where you could have a meal and watch a cabaret act. I was lucky to "do the ships" when I was young, involving a round-the-world cruise, Mediterranean cruises, Atlantic-crossings, cruises up the west coast of North America from San Diego to Alaska, and from the Canaries to the UK, and a long stint cruising in the Caribbean on various ships. What a lucky lot we are as musicians! In the Bahamas, I worked in a band backing a show in a casino in Freeport, where I also wrote the music for a film, Bahama Green which has since vanished without a trace. After that I did some voluntary work and became very active in various pressure groups. I was chairman of Ringmer Peace Campaign, on the committee of Lewes World Disarmament Campaign and helped to set up Lewes CND. Because I had already helped organise a number of exchange visits between people in Sussex and Hungary, I was asked to be the chairman of Lewes Links with Eastern Europe - a post I held for 5 years. As a result of our efforts in collaboration with our Hungarian friends, an Accord was signed between the county of East Sussex and the county of Veszprém. Unfortunately there were local elections in both counties soon afterwards and the Accord was forgotten about. Never trust local government or national government (or even the electorate) is the lesson I learned from that. Anway, I still had to earn a crust (literally, as that's all you can earn as a jobbing musician) so I drifted back into music. In 1985, I won an award for a jazz and poetry concert and the following year I was given a commission to write a suite for a 7-piece band which was performed in Brighton and Dieppe. Regarding other cross-cultural events, I've also did two jazz and (spontaneous) painting gigs with the artist, Tom Walker, which were great fun. 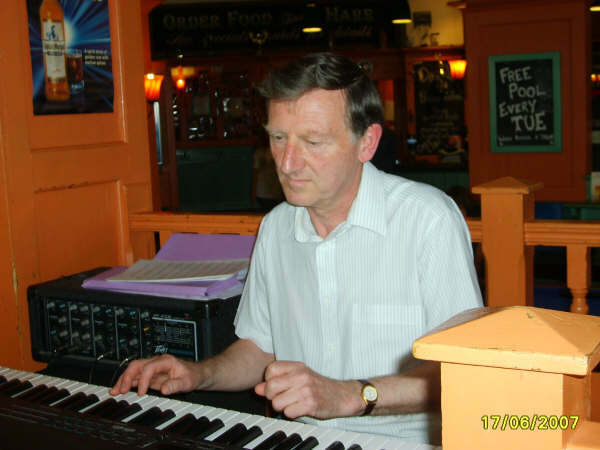 Over the years, I taught piano privately and at a couple of schools (both of which I failed dismally at) and in the 1980s I was a tutor at various jazz workshops. Since then I have visited Eastern Europe many times - a fantastically beautiful part of the world with wonderful folk music. I've also had the chance to visit Saudi Arabia a few times to play in a jazz band on one of the compounds for foreigners. Knowing what I know now about the human rights situation in that country, especially for women, I should not have gone. The action of the Saudi armed forces in Yemen using weapons sold to them by Britain which may resulted in millions of people dying from famine also sickens me. The clash between getting gigs and standing by your principles is always hard and I am not happy that I made a wrong decision. I am a firm believer in multi-culturalism and believe that immigrants to Britain have contributed a lot to the country and made it a much more interesting place to live. Going back to music, over the course of years, I have written a lot of arrangements for different-sized bands in many different styles, but in recent years I have concentrated on original compositions which gives me more freedom, but no money. For many years, I was a member of Bill's Bones - a 6-trombone plus rhythm section band run by Bill Guy - a great band, but we didn't get many gigs. That must be true of many great bands. A few years ago I led the Sussex Jazz Orchestra but left it in November 2007 after nearly two years at the helm as the organisational part of it was consuming so much of my time. I intended to start up my small band again - 5-piece, or 7-piece, but didn't get round to it. At one time, we used to do quite a few gigs. I was also the pianist with a women's choir - The Sovereign Singers for a few years. In 2009, I was commissioned to write a big band suite for a gig in May 2010. You can read all about it on the Watermill Jazz Suite page in the Projects section. This went down well, thanks to a wonderful line-up in the band, including the trombonist, Mark Bassey. I decided to keep the band going. My next project was to write a Brighton Jazz Suite which was performed in May 2011 with guest trombonist, Barnaby Dickinson. It was a good concert, but the audience was not as big as I had hoped for, as the media totally ignored the many press releases I sent out. "Not newsworthy", I was informed by a local newspaper. Hold on, an original suite written about Brighton, played by some of the best of the local musicians with a celebrated guest player at which the mayor of Brighton was in attendance - not newsworthy? So what was in the newspaper that day - someone walking around the streets wearing an ape's costume. After the Brighton Jazz Suite, I set to work writing an East Sussex Jazz Suite. The first performance was in November 2012. Writing for my great band gave me a great opportunity to write for some wonderful musicians, and to explore ways of writing for mixed saxes and woodwind (flutes, clarinets, soprano saxes, etc.) The gig was disappointing. There were few people there and we did screw up several of the charts, but at least as no-one had ever heard the music before they didn't realise it, at least I hope they didn't. We were given another booking at the Watermill Jazz Club for May 2013. Once again, the audience was quite small and we made quite a few mistakes (my conducting in particular), but there were some excellent solos and the ensemble and section playing were really good. For some time I had wanted to record the band, but as some members lived quite a way away and some of them had other jobs, I found it impossible to organise. However I thought I could get over the problem by having the gig at the Watermill Jazz Club videod. Most people I sent the video to never responded and I got one very scathing review of it. This was very depressing and tied in with the fact that we had attracted small audiences, I did not feel it worth-while spending hours a day writing music which hardly anyone would hear. The following gig on November 10th 2013 at the Brunswick in Hove - was to have been the final one as I intended to quit the band and unless someone else took it over, it might have folded. The gig consisted of a further batch of tunes from the East Sussex Jazz Suite. The gig went really well, the band played fantastically and we had a good audience. I did disband the band for a while. I also resigned from the Musician's Union and quit playing solo piano at the Grand Hotel in Eastbourne. I had done it for 26 years - a soul-destroying job, but I was glad to have the gig at the time and receive a regular income. I soon got fed up with not knowing what to do apart from Sudoku puzzles, and got in touch with the band members about restarting it which they were in favour of. The next project was a One World Jazz Suite. Starting a new suite from scratch is a bit daunting but after a few numbers it gets psychologically easier. I added a guitarist and another sax player/flute player to the band. The concert was on October 19th 2014 when the celebrated Hungarian sax player, Mihaly Borbely, who was nominated as the best alto player at a big European jazz festival, came over to guest with the band. Mihaly is not only a brilliant sax player and composer but also teaches at the Ferenc Liszt Academy of Music in Budapest. He is active in both the jazz and folk genres. He stayed with my wife and I for the few days he was over here and it felt like having a soul brother around. Such a nice man and a great player. See his website: www.mihalyborbely.hu. I fixed a gig in the Twickenham Jazz Club, run by my old friend Kelvin Christiane, for him to play with just a rhythm section. This went very well. A few days later, Mihaly wanted to put on a Masterclass. To my great disappointment and embarrassment, only 3 people turned up for it even though the city is crawling with musicians. This says a lot about Brighton, or perhaps it just shows how unpopular I had become. The gig with Mihaly and the big band went well. But again, much fewer people came to it than I had anticipated. This left me feeling very depressed. So I decided not to put on any more big concerts for the next year. However the band liked the music so we played for our own amusement at rehearsals. I regained my enthusiasm for writing after some months and finished some new arrangements for part 2 of the One World Jazz Suite. Writing for my band had been an enjoyable experience, especially as now I had a lot more instruments to write for - tuba, souzaphone, alto-flute and bass-clarinet. I relished the new challenges. I also changed its name to the Paul Busby Bigger Band to get away from the stereotype of what a big band should sound like. The concert itself, which was performed in the Brunswick, Hove on the 5th June 2016 attracted a large and appreciative audience - see videos on youtube in my channel. My decision to quit was also influenced by another factor. On this website, sales of my arrangements had been very disappointing although I had over 1,000 downloads of my free charts per month. A few people however told me they really enjoy playing the charts and sometimes they are used at charity functions. This meant more to me than the small amount of money I could have earned from them, so I decided therefore to make all of my music free for anyone to download. I had been wrestling for a time with the notion that jazz is of little real value. Giving it all away would help salve my conscience about spending so much time on it when I could have spent the time doing something of more value to help other people. As far as playing is concerned I am now retired, but I am have to admit that playing was never my strong point. The gig on June 5th 2016 at the Brunswick in Hove with my big band was my last as I gave up playing, writing music and teaching after that. Running a big band is very stressful and expensive. When I listen to classical music I realise just how primitive so much of jazz is and how inadequate my own writing had been and yet I have deluded myself about it and wallowed in self-indulgence for too long. Time to do something different. I therefore became a volunteer for the Red Cross. I really enjoy this. Good to help other people - wish I had done it years ago. I had a complete break from music for 6 months. Then decided to write some new charts for my old band, now the One World Orchestra, led by someone else. However I realised very soon that it was time to move on. For several months I busied myself studying scores and reading books and watching videos on classical music. But I have to admit that I am well and truly out of my league here and I don't think I can contribute anything new. But I have given it a go. I am also petrified of the classical music police (like the jazz police but many times worse). For anyone interested, you will find my classical pieces are now listed on this website. Look for "string quartets" on the home page. Well, it was an experience trying to write classical music but after a lifetime of being in the jazz field, I found it hard to adopt to it. The harmonic system is totally different and the syncopated rhythms which have become embedded in my DNA keep interfering. I don't like the sound of a lot of modern classical music which is just ugly and without the warmth that jazz has. And I detest the vibrato - just don't mention opera singers to me! So I really do think that now it is time to put music behind me and concentrate upon my Red Cross work. I am now decomposing! There you have it. If you were expecting a list of big names, sorry to disappoint you but name-dropping is against my principles. So please judge my music on its own merits (or lack of merits) rather than on the company I've kept. Last edited in February 2019.